Turn the treasured memories and menu of Grandma’s old-fashioned Sunday supper into a spring celebration when you gussy up ham and potatoes with Spanish ingredients. ¡Salud! Sherry and apricots make a sweet, caramelized glaze that beats any premade glaze packet. Choose a sherry labeled Fino or Manzanilla — other varieties could be too sweet. Bring ham to room temperature, about 2 hours. For the glaze, simmer sherry, honey, preserves, paprika, allspice, zest, and orange juice in a saucepan over medium heat until reduced to 1–1¼ cups, about 25 minutes. Preheat oven to 300° with rack in lowest position. For the ham, combine orange juice and allspice in a roasting pan. Place ham, cut side down, on a roasting rack set inside the roasting pan. Brush one third of the glaze on the ham; seal the pan tightly with foil. Roast ham until a thermometer inserted into the thickest part, but not touching bone, registers 100°, about 15 minutes per pound (1½–2 hours). Remove ham from oven; increase temperature to 425°. Brush ham with half the remaining glaze; return to oven, uncovered. Continue roasting ham until a thermometer registers 110°, about 20 minutes more. Transfer ham to a cutting board, brush with remaining glaze, loosely tent with foil, and let rest about 15 minutes before serving. 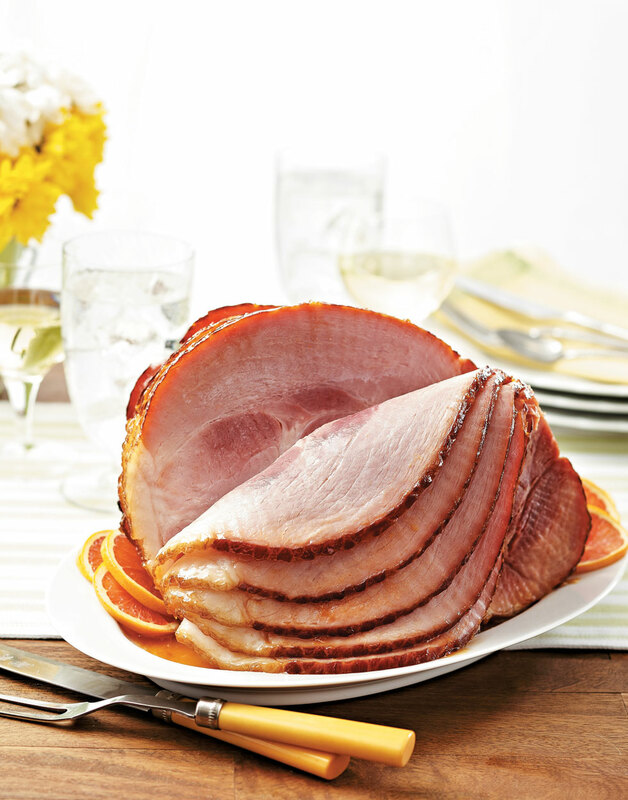 For the best flavor, brush the ham with the glaze before, during, and after roasting. To temp, insert the thermometer into the thickest part of the ham, without touching the bone. Tenting the ham with foil keeps the ham warm while the juices in the meat redistribute.